Let me take my online shopping for example. A few years ago, it was the first birthday of my best friend’s daughter. I logged on the Internet to buy picture books for her. When I first went some infant picture book shopping malls, I was overwhelmed by numerous books in their kinds and colors. Their pictures were also so fascinating and eye-catching that any baby would be attracted. In addition, every book had words and phrases like the best-selling, the most popular, educational, and creative. These things made me believe no matter what I bought, there would be no regrets. However, just in case, I called my friend to ask if he liked book series that I had chosen. Contrary to my expectation, he told me not to believe all the false and exaggerated advertisements and instead to visit consumers’ websites where they shared information about products. On one of the websites, I was able to read what moms and dads wrote about picture books that they had bought. Besides, the community had the to-buy and not-to-buy lists. Sadly, picture books that I was going to buy were on the not-to-buy list. After fully informed, I shopped around again and everything looked different. I was no longer so naive to be attracted by the lies in the commercials. This entry was posted in English and tagged English, essay, universal essay, Writing on December 17, 2009 by enddl22. Whether you write an occasional professional letter or a daily newspaper column, William Zinsser’s On Writing Well should be required reading. Simplicity is Zinsser’s mantra: he preaches a stripped-down writing style, strong and clear. He has no patience for excess (most use of adjectives and adverbs, he writes, just adds clutter) or tired phraseology (for instance, he’d like to outlaw all leads involving those “future archaeologists” most often found “stumbl[ing] upon the remains of our civilization”). 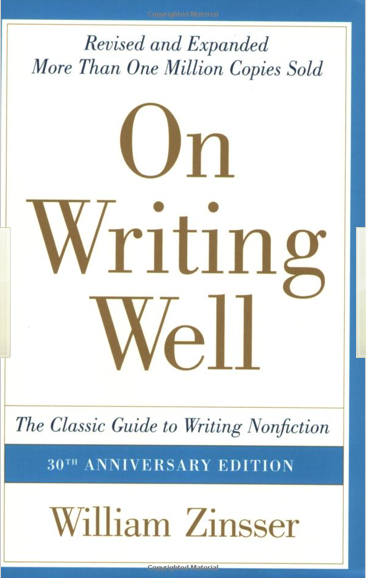 He recommends that all writers of nonfiction read their work aloud (don’t commit something to paper that you wouldn’t actually say) and write under the assumption that “the reader knows nothing” (not to be confused with assuming the reader’s an idiot). In addition to the chapters on the expected–usage, audience, interviews, leads–Zinsser also focuses on such trouble spots as science and technical writing, business writing, sports, and humor. –This text refers to an out of print or unavailable edition of this title. This entry was posted in English and tagged English, Writing on December 17, 2009 by enddl22.